The nice-looking flagship cell phone LG G6 came out. Are you considering to proceeding one as your new substitution with some features which may have strong appeal to you? And here we share another feature on how to download and transfer your favorite YouTube videos or music to LG G6. You may have multiple videos or music videos on YouTube channel and want to download to keep them on you big screen LG G6 for enjoying. Now, you just need to download a free YouTube Video Downloader, so that you can download and transfer YouTube videos to LG G6 fast and easily. Go to YouTube or your favorite video site to search for the videos or music video you would like to save and then copy the video download link from YouTube webpage. Press the Add URLs button, then a dialog will pop up, just click icon to paste the download link. Note: Before downloading videos or music, please press Online Video Tab, then simply choose Manually Select under Select Format thus you can choose the video format such as HD, MP4,etc or audio format M4A that you need when downloading. After choosing the video format you want, press Start Download! button and click "OK" to start downloading videos. Then right-click the Downloaded file, click Open Destination File Location from the pop-out menu to find downloaded YouTube videos. If you have few videos need to be transferred, just connect your LG G6 to computer with USB cable and transfer your downloaded YouTube videos to it. If you have multiple videos, you can download Syncios Mobile Phone Transfer to transfer YouTube videos to your LG G6 freely with one-click. And it is an all-in-one iOS & Android Manager for syncing video, images, music between iPhone, iPad, iPod, Android and PC. Because LG G6 supports very limited video formats (MP4, H.263, H.264, H.265, VP8, VP9, Xvid), and DRM protection inserted in iTunes videos, you can't play iTunes M4V videos on LG G6. But luckily, here this YouTube Video Download also can help you remove DRM protection from iTunes videos and convert them to variety of video formats. 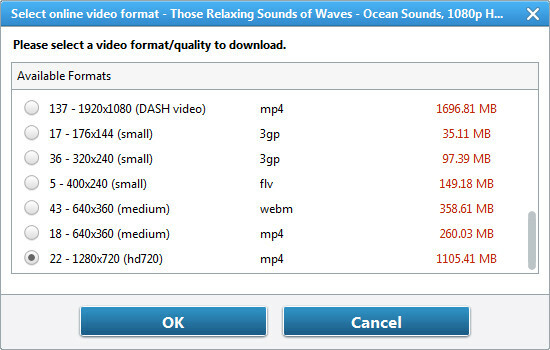 Note: You can choose Customized MP4 as output format, and Video Codec H.264, H.265, Xvid are supported. iTunes M4V Movie Will be Recorded Automatically in the separate window. After successfully recording, the iTunes M4V Movies or TV Shows will be converted to your desired formats.